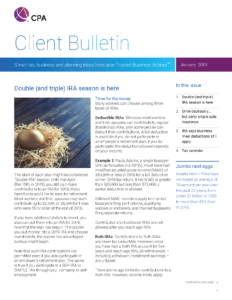 The start of each year might be considered “Double IRA” season. Until mid-April (the 15th, in 2019), you still can make contributions to an IRA for 2018, if you have funds you’d like to save for retirement. Most workers and their spouses may each contribute up to $5,500 or $6,500 for those who were 50 or older at the end of 2018.